Taoiseach repeated today that he did not think it was a resigning matter. 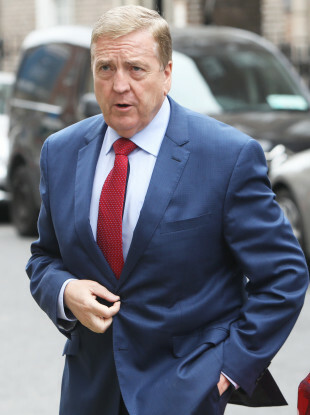 FIANNA FÁIL LEADER Micheál Martin has said Minister Pat Breen’s explanation that he just passed on an invitation to former Communications Minister Denis Naughten from broadband bidder David McCourt “isn’t credible”. Speaking during Leaders’ Questions today, Martin asked the Taoiseach if he had asked Breen about how it came about that he extended a dinner invitation, at the request of one of the National Broadband Plan bidders, to the then communications minister. I have gotten to know Mr McCourt on a personal basis, have visited his Co Clare home several times and met him on other occasions in a private capacity. Last year, on the request of Mr McCourt, I asked Denis Naughten, then Minister for Communications, if he would like to come to a dinner in Mr McCourt’s house. Mr McCourt’s wife also attended the dinner. To my knowledge, the National Broadband Plan was not discussed at the dinner. David McCourt is now the last remaining bidder to the NBP. Naughten was forced to resign last week after he admitted to meeting McCourt on a number of occasions, with no minutes taken or officials present at some of the meetings. Breen has also stated that he has met with McCourt a number of times. It is not a credible explanation, to be frank. TheJournal.ie asked the Taoiseach yesterday if he had spoken to Breen about the matter. The Taoiseach told this website that he had spoken to Breen and accepted his explanation. I spoke to Pat Breen about it and Pat Breen’s explanation, which I accepted, is that Mr McCourt asked him to pass on the invitation, which he did. Pat, at the time, asked Denis Naughten as to whether it was okay for that meeting to happen, and it did. “Pat Breen was present. But ultimately the decision as to whether it was appropriate or not to accept the invitation was one for Denis Naughten,” said Varadkar, who added that Breen had no role to play in decision-making process for the NBP. I am sure in retrospect we can all see it was unwise, but a resigning matter it is not. The Taoiseach repeated the line in the chamber today, stating that Breen told him McCourt asked him to pass on an invitation to Naughten to have dinner with him in his house. “They live quite near each other. Deputy Breen passed on the invitation, Deputy Naughten accepted it and the dinner took place. He also informs me that the national broadband plan was not discussed on that particular occasion,” said Varadkar, who repeated that he did not think Breen’s involvement is a resigning matter. The Taoiseach said the review of the NBP to ensure that it has not been compromised is due to take about three weeks. The terms of reference will be established in the coming days. He said the final tender for the broadband plan was received on 8 September and is being evaluated. For this reason, Varadkar urged TDs to be “careful” with their language when discussing the last remaining tender. “People who care about rural Ireland” should to be careful and accurate when commenting on the issue, he added. A government spokesperson confirmed there was no discussion about junior minister Breen at today’s Cabinet meeting, with no Independent Alliance members raising any concerns. Email “Martin rounds on Breen over dinner invitation to NBP bidder's home: 'It is not a credible explanation'”. Feedback on “Martin rounds on Breen over dinner invitation to NBP bidder's home: 'It is not a credible explanation'”.